Doodlecraft: Hand Lettering Merry Christmas on Kraft Paper: Creative Gift Wrapping! 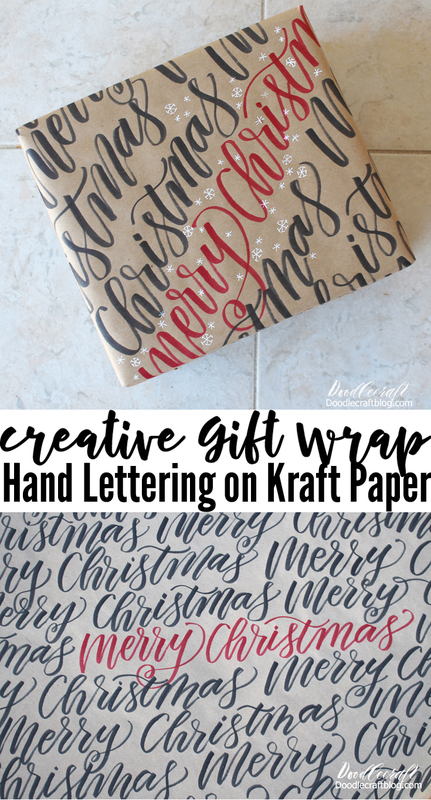 Hand Lettering Merry Christmas on Kraft Paper: Creative Gift Wrapping! Practice your hand-lettering skills and make amazing gift wrap for your Christmas gifts. I am not the greatest gift wrapper, but I like to decorate them and make them cute with creative gift wrapping and cute gift tags. Add a fun hand touched look to all your gifts with this quick project. Cut a piece of kraft paper the size to wrap your gift. Then start in the top corner and use a black dual brush pen to write Merry Christmas (or whatever phrase you want). Then continue writing over and over to fill the wrapping paper. Don't worry if it is sloppy, it's the perfect way to practice. Once you arrive at the center, switch and write the phrase in red pen. Then continue to fill the page with black pen until finished and completely filled. Add a holly berry on each corner of the paper...just for fun. Now the paper is ready to wrap around the perfect fit. It looks amazing and adds a great personal touch to any gift. Such a fun way to practice lettering too! Use a white gel pen to add some fun snowflakes to the gift too!